Our Self Dumping Hoppers Are Built to Last! Rhino self dumping hoppers are idealy suited to handle, store, move and discharged large volume of garbage easily and effortlessly. Our self dumping hoppers are being used by large facility managers for collecting garbage from a large number of sources and dumping it into the municipal skips. Industrial waste needs to be continuously moved from sources of generations to disposal areas ad RHINO self dumping hoppers serve the purpose by efficiently handling industrial waste. Meet processing factories, packaging units, garment factories, furniture and joineries, poultry and dairies, large retail outlets and vegetable markets etc all need Self dumping hoppers for their industrial waste management issues. No doubts RHINO self dumping hoppers is their best choice. RHINO self dumping hoppers are perfect solutions for the segregations of scrap such as paper, plastic, glass, metals and wood. Self-dumping hoppers help store and transport segregated scraps to designated processing areas. RHINO builds heavy duty self dumping hoppers for the scrap segregation industry. RHINO manufactures stainless steel and galvanized self dumping hoppers for the food industry. RHINO self dumping hoppers come in S.S 304 and S.S 316 and are customized to suit individual preferences. RHINO self dumping hoppers are useful tool in fruits and veritable washing areas meat washing areas and storing and moving of dry food stuff in large food processing factories. RHINO self dumping hoppers are also manufactured from perforated stainless steel for draining water or liquid from process food. Many industries waste large quantity of fresh water as sludge. RHINO Self dumping hoppers help in saving water by acting as sludge separation tanks. RHINO sludge hoppers are lined with reverse osmosis fabric and help in the removal of sludge and solids from recyclable water. RHINO customizes its self dumping hopper design and sizes to suit individual sludge removal requirements. Handling dust is always a mess specially for industries like furniture and ceramic, RHINO self duming hoppers also perform as perfect dust collectors. RHINO produces a self dumping hopper which is an air tight hopper designed to retain dust/saw dust/powder etc in the reusable bags and dissipate clean air. RHINO designs and fabricates tailor maid self dumping hoppers for any scale of dust collection operations. Our self-dumping hoppers are available for use in a wide variety of applications. RHINO self-dumping hoppers fit any application, no matter what the scope of your project. You can also build your own hopper by customizing and designing any of our six models to meet the specific needs of your business. All paint is industrial primer and enamel on steel. CAT Yellow is our standard color on all hoppers unless otherwise specified. RHINO manufactures stainless steel and galvanized self dumping hoppers for the food industry. RHINO self dumping hoppers come in S.S 304 and S.S 316 and are customized to suit individual preferences. RHINO self dumping hoppers are useful tool in fruits and veritable washing areas meat washing areas and storing and moving of dry food stuff in large food processing factories. RHINO Self-dumping hoppers take heavy workloads and knocking around. These Self Dumping Hoppers are essential tools for in-plant housekeeping, in-process material handling, sorting and storing. 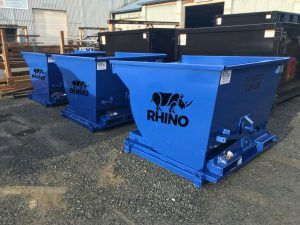 RHINO Self Dumping hoppers are ideal for scrap collection, material recycling and other rugged applications.